I discovered a little secret for elevating my home decor game about a year ago. If you’ve never heard of Pocket Frames by Details2Enjoy, brace yourself, because they are the coolest thing since pockets on a T-shirt. The top of the frame is magnetic, and the frame itself has two tracks inside that can be used in a million or so different ways with either a sign of your own or inserts and kits that make you feel like a sign-making rockstar when you put them together. Looks pretty simple, but the possibilities are endless! With winter just around the corner, I tasked Kami with painting a new insert to switch out in a few weeks. Note: I will show how to paint the frame even though I plan to just use the same frame and switch out the insert. She used chalk paint that I already had mixed up in three colors: Benjamin Moore “Mink” for the outer frame as well as white and black. Because I make my own chalk paint with BB Frösch Chalk Paint Powder, I can afford to craft with it. I love it so much more than craft paints because I can do fun techniques like faux stain, distressing, etc. Chalk paint looks so much nicer than craft paint, and the coverage is so much better! Tip: Mix your chalk paint into squeeze bottles for neat and tidy crafting. First, Kami used my favorite faux stain technique to paint the outer frame, then she used BB Frösch Dark Premium Finishing Wax to give it a nice, finished look. She painted the adorable shiplap insert white. The words that come in the kits are awesome because they are 3D. You can also buy just the word kits from Details2Enjoy if you want to make bigger signs. Kami painted the “joy” black and cut the felt that came in the kit into a little sprig. 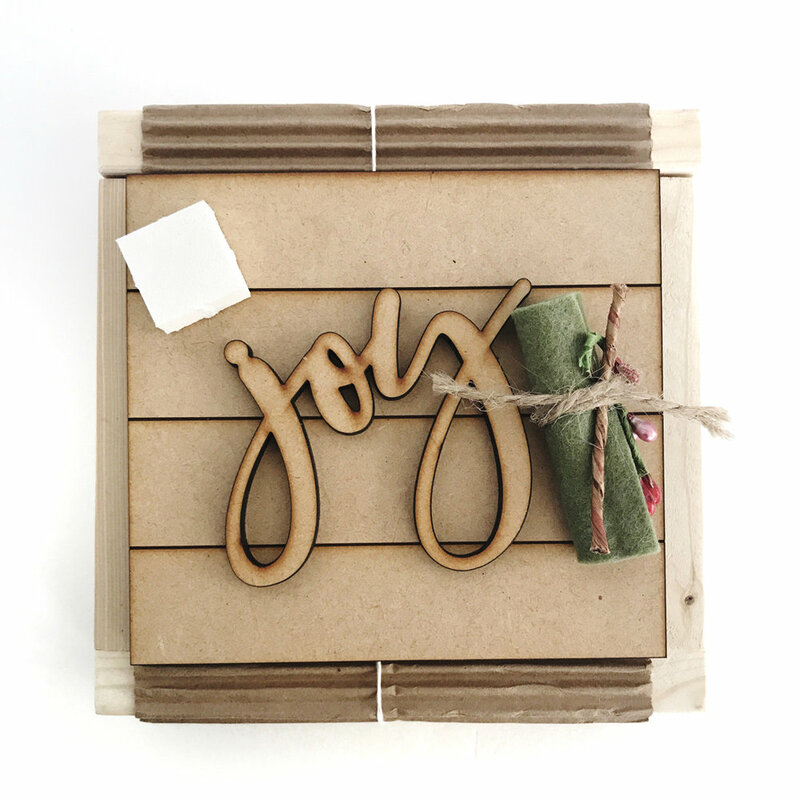 Once everything was painted and dried, Kami glued the “joy” on with wood glue and the little sprigs with a low-temp glue gun. The whole project took less than an hour. The best part about pocket frames is I don’t have to buy or make a whole new sign when the seasons change or when I get the itch to switch up my decor! I can just change out the insert. You can find more cute inserts and kits here. If you plan to attend the Salt Lake Pinners Conference in November (and why wouldn’t you?!? It’s the only place you can find hundreds of classes to learn everything from painting, cooking and sewing to applying makeup and braiding hair. Plus it’s the best shopping around! ), we’ll be teaching this class! You can get tickets for Pinners Conference here. Use code “BBF” to get 10% off.